After the attack of ISIS aimed at the region in the vicinity of Kobani's Mürşitpınar Border Gate, it has been claimed that those who organized the attack passed into Turkey from Kobani after the attack. These rumors have been refuted by the authorities with documents and it has been determined that the ISIS members infiltrated into Kobani from Cerablus, Syria wearing YPG uniforms. However, despite this fact, some dark powers portrayed Turkey as responsible for the incidents in social media and proceeded with the preparations of a new provocation. Following the attack of ISIS, a black propaganda campaign against Turkey, who actually opened her borders to both the wounded from Kobani and to Kurdish refugees, was started on Twitter. Sympathizers of the PKK and YPG claimed that the ISIS militants came to Turkey after the attack and they started a hashtag for Turkey accusing her of being a "terrorist" supporter. The hashtag #TerroristTurkey (in English) soon became one of the top trending topics. On the same day, Mr. Adnan Oktar started a hashtag on his live broadcast on A9TV against this atrocious attack; #TeröristPKK YPG. Mr. Oktar called on all youngsters from the AK Party, the MHP, the BBP and the Felicity Party to support this hashtag and to show the power of the Turkish youth against this atrocious slander. This hashtag Mr. Oktar started soon overtook the hashtag PKK supporters started to defame Turkey on Twitter and became one of the highest ranking Top Trending Topic on Turkey's and the world's agenda. Stating that Turkey had nothing to do with the attacks of ISIS, Mr. Adnan Oktar reminded the audience about the fact that the PYD, PJAK or the YPG are no different than the PKK and drew attention to the fact that they all are communist organizations acting under the banners of Öcalan and the PKK, and that they actually are identical to the PKK. Furthermore, Mr. Oktar noted the fact that it was again the PKK who introduced violence and horror to the region and who spread terror in the region. Mr. Adnan Oktar called on all of Turkey to support this hashtag and to explain the facts to the world and said, "None of our Turkish youngsters should ever accept such a treacherous world-wide attack against our country." 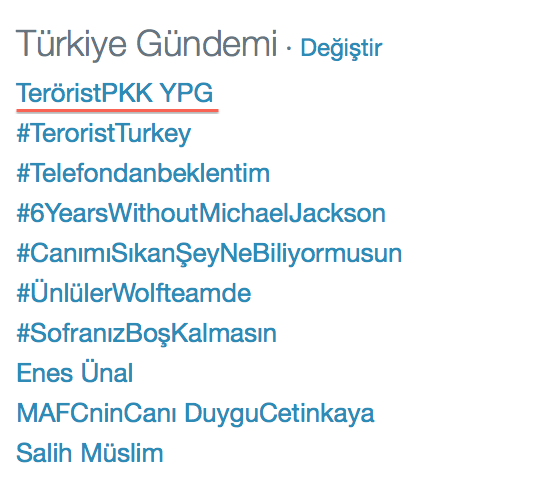 And Mr. Oktar's call had wide repercussions in a short time and the hashtag #TeröristPKK YPG became one of the highest ranking topics on Twitter TT lists. Obama made a statement about Islam in which he said that one of the biggest religions of the world is now facing a deadly strain. He said that there is nothing new about wars within religions and that Christianity endured centuries of vicious sectarian conflict. He also said that it is time for the world – especially Muslim communities – to explicitly, forcefully, and consistently reject the ideology of al Qaeda and ISIL. And that it is time that political, civic and religious leaders reject sectarian strife. Actually they simply take the color of the place you put them on, just like a chameleon. Not all of them, but some of them are like this. So what Obama should do is not to find and gather the Islamic scholars because they are always gathering them yet nothing comes out of their gathering. America should find the person and the people that they must find essentially. The CIA and the FBI have the necessary means to do this. Actually there is no need for them anyway. They have their own foresight, perception, and reason. They have their own conscience, they can find by using their reason. God will let them know the one who is going to save the Islamic world. If these scholars were the ones to save the Islamic world, then why would they wait for centuries? A century has passed and Muslims are living in misery for a century. There are hundred thousands of scholars, but most of them are going after their own interests and their own pleasures. If they are comfortable, then everything is okay for them. They consider being a scholar as a profession anyway. If he can earn money to look after his wife and kids then it is enough for him; the rest is not important for him. They are like a weather vane; they move according to the wind. Obama and the American government and Putin also should see this misery there. They shouldn’t wait until this disaster stops. 'It is inappropriate in Islam to kill innocent people, to kill the delegates and the journalists, to name as heretics the ones who don’t show their profanity openly, to behave badly to the Christians or to the people of the Book, to force people to become Muslims, to revoke the rights of the women and the children, and it is also inappropriate in Islam to announce the Caliphate without the unity of Islamic societies'. Adnan Oktar: ‘Now take these scholars and put them in the region where ISIL is located. Let them eat together, and sit together and after that ask for a fatwa from them, they will give the opposite fatwa. Oppositely they would say, ‘It is appropriate, it should be done’ and also they can explain it in detail from the false hadiths. They can give fatwas for all of them. They flip flop according to the environment they are in. Now, I think the governments have forced them, this is probably not an idea that came to their minds. I think the politicians forced them. It was like this all through the history. For example, in some cases the Sultan called the Shaykh al-Islam and he got a fatwa just as he wanted. Among these scholars also, there is such a spirit of issuing fear-based fatwas. Ok, ISIL is bad and is in the wrong and their leader is not the Caliph. Ok, but don’t the Muslims need a leader? No answer. Will Hazrat Mahdi (pbuh) come? No answer. Is the Islamic Union needed? No answer. Look, none of them gave answers to those questions. They are not saying; “Alright, this is not the way things should be, but this is how it should be.” They are simply saying, ‘This is not the way things should be!’ So how should things be? Then he says “I don’t know that”. In that case, God wouldn’t give salvation. The militants of ISIL believe that al-Baghdadi is Hazrat Mahdi(pbuh). All of them believe that he is Hazrat Mahdi. These scholars do not say: ‘these are not the signs of Mahdi, but this is’. Yet people are calling them Islamic scholars. The Islamic scholars should tell the truth. Look, there is ‘enjoining what is right, and forbidding what is wrong’ in the Qur’an. By making this call you are forbidding what is wrong and that is okay, that is nice. How about ‘enjoining what is right’? Do that and say what is right. Where is the truth? They are not telling the truth. If a person says that something is wrong, then how doesn’t he say what is right? Wrong is pointed out to tell the truth. You are saying what is wrong, but not talking about what is right. That shows that you are misdirected. They are saying that ISIL is bad, and the caliph who they chose is not valid, that’s all. You should say how to pick a leader who will be conducive to the salvation of the Muslims. You should say that Hazrat Mahdi will come and you should speak of the portents of his coming. Yet you say nothing of the sort. If you are an Islamic scholar, you should also tell the truth. They should not change the topic, they should not change the subject; they should not change the target either. The PKK is the greatest threat in the region. The PKK is the greatest threat to the Turkish nation. They’ve been causing great distress to our people in the region for forty years. They’ve been a thorn in our side for forty years. I consider it very wrong to still keep talking about the threat of ISIS. There is only one threat and that is the threat of the PKK. Let us devote all our attention to the PKK as a nation. Let us draw Europe’s attention to the PKK; let us draw the world’s attention to the PKK. The PKK is the greatest danger. How is this explainable? They have very recently martyred three of our lions. What kind of people are those (who plead ignorance against the PKK)? I fail to understand. They have very recently martyred three of our brave lions. But these people still don’t seem to mind. They keep talking about ISIS. We have no problem with ISIS. All we care about is the PKK and that is it. We have no ISIS problem. Let them come to me when we actually face such a problem. That could never be the issue. The PKK directly attacks Islam. They are Godless, Bookless and they attack God, faith and Islam. The Christian world does not take any steps against the PKK; they keep their silence. I have never heard any statement of the Pope’s against the PKK. Let us ask the Pope to issue a statement against the PKK. Let us ask the Pope to issue a statement to the Christian world. Let us prepare a letter addressed to the Christian world explaining the PKK’s treachery, perfidiousness and enlightening the whole of Europe and the US and the whole world about this. Let us first take a step that would wipe out the PKK. I mean adopting an attitude as if the PKK does not exist is not acceptable. ISIS is cruel, that is correct, but the PKK is a thousand times crueler. They are brutal, Godless, Bookless and treacherous. They are both Godless, Bookless and treacherous, perfidious trappers and plotters. World public opinion should be warned against these scum. They have such hussy methods of propaganda. They try to present themselves as if they are normal people towards the whole of Europe even though they actually are the scum of the earth. We need to present them as the scum of the earth they actually are to the whole world. We need to explain this persistently. Some Europeans do believe them. They serve the purposes of some European communists and so they plead ignorance against their true nature and try to cover up their filth. We need to be very cautious against this. They are still talking about ISIS. These people, the PKK, say that they will disintegrate Turkey and they challenge the Turkish state. They are martyring our beloved lions day and night. Yet some people still say that we should provide heavy weapons to those scum. Are you kidding us? They are mocking us saying that we should give heavy weapons to the PKK. Look at this attitude; they have such an irritating attitude. As if this is not enough, they have martyred ten thousands of our lions; there are funerals and graves of our martyrs all around the country. Those dear mothers of ours are waiting beside the graves of our beloved lions, our beloved martyrs, looking after them, watering their flowers, cleaning their marble headstones. ]]>http://secretbeyondmatter.com/en/Mr-Adnan-Oktars-Daily-Remarks/194250/world-public-opinion-should-behttp://secretbeyondmatter.com/en/Mr-Adnan-Oktars-Daily-Remarks/194250/world-public-opinion-should-beSun, 23 Nov 2014 17:12:17 +0200"Non-governmental organizations should support the Turkish state in the struggle against the PKK"
The Turkish state should constantly draw attention to the PKK. The government might fall short of doing this, but the non-governmental organizations, media and everyone else should alert the world against the PKK and do what should be done. Due to its position, the government could fall short of this and might not be able to talk against the PKK because of this notion of a “solution process”. But the public, the people could easily keep talking, the media could keep talking. ]]>http://secretbeyondmatter.com/en/Mr-Adnan-Oktars-Daily-Remarks/194217/non-governmental-organizations-should-supporthttp://secretbeyondmatter.com/en/Mr-Adnan-Oktars-Daily-Remarks/194217/non-governmental-organizations-should-supportSun, 23 Nov 2014 02:47:41 +0200"The PKK is a thousand times more dangerous than ISIS "
Those who do not consider the PKK as a threat are actually overlooking the recent attacks of the PKK. I believe that those who do not consider the PKK as a threat would probably be alarmed with the attacks conducted by the PKK against the Turkish state, if they have a conscience at all. The PKK is a thousand times more dangerous than ISIS. It is a grave danger that directly targets the Turkish nation, the Turkish state. What is ISIS to us? ISIS is not our concern at all. What directly concerns us is the PKK. All the governments of the world should be warned and informed about the PKK. The fact that the PKK is a danger to Turkey is only being voiced with a timid attitude. The PKK is in such a fierce and spoiled attitude in Turkey. Making use of the tolerance of our state, making use of the compassionate, warm-hearted attitude of our police, they are doing all sorts of viciousness. Let us first take precautions against the PKK and then concentrate on ISIS. The PKK has martyred thousands of our soldiers and police officers. Now are we supposed to consider these treacherous ones as non-existent? ISIS has not yet martyred a single soldier or police officer of ours. We have no business with the ISIS, our enemy is the PKK and it is the organization that conducts enormous activities and that constantly threatens the Turkish state. Let us mobilize all international forces; let us establish an international coalition to conduct an intense campaign of activities to wipe out the PKK. Let us firstly channel the international force that has been prepared for ISIS to fight the PKK. Let us stop all the locations of reinforcement and blockade all bastions of the PKK; if need be, an economic blockade could be widened in all respects. I am not advocating bloodshed, I am not asking for violence but an international coalition could easily bring the PKK to its knees. With a powerful military blockade the PKK could be completely paralyzed. Before paralyzing the PKK, if they keep saying, “Let the PKK remain untouched and wipe out ISIS,” that means there is a plot against the Turkish nation. Why should the PKK remain untouched? I mean if anything, the PKK should also be wiped out along with ISIS. If they say that the PKK should remain untouched, there is something wrong in this. ]]>http://secretbeyondmatter.com/en/Mr-Adnan-Oktars-Daily-Remarks/194215/“let-us-establish-an-internationalhttp://secretbeyondmatter.com/en/Mr-Adnan-Oktars-Daily-Remarks/194215/“let-us-establish-an-internationalSun, 23 Nov 2014 02:39:15 +0200“Before ISIS, they should wipe out the PKK"
Before ISIS, the state should wipe out the PKK. I mean, if we need to send our soldiers there, if there is a necessity for an international intervention, the PKK is a thousand times worse than ISIS, they are much fiercer. Let us start from there. Let us wipe out the PKK first, and then the job to be done about ISIS is very easy. Adnan Oktar: “That is great. Furthermore, it would be great if our state could show us to a foundation; this foundation should help our veterans and the families of our martyrs. Our citizens could then contribute to this foundation. Let us infuse all our aid, food, clothing, money, whatever we can give to the families of our martyrs, to our veterans, to those beautiful mothers. That foundation should have cars and should pay frequent visits to these families. The youngsters should take those cars and put them into their service in those homes. Saying, “Mom, do you have an order for me? Do you want anything? Dad, do you have an order for me? Is there anything you want?” the youngsters should protect these families everywhere, in every district. This is a requisite of kindness, of decency. Look, that person gave his life for you, for our homeland, for our people, for our religion, for our faith, for your honor. Look, life is gloriously valuable and those people gave their lives for that. You should devote your life to their families as well. They gave their lives for you; you are still alive, you are living a comfortable life. So you should devote your life to them, you should protect and watch over them, devote a portion of your day to them. That is a beauty that brings about abundance. How nice it is that a hairdresser, for instance, thinks about how he could contribute and says, “If a relative of a martyr or a veteran comes to my shop I will not take money from him/her.” The taxi driver thinks, “What can I do?” and says, “I can take them to wherever they want free of charge.” And that is a splendid thing. Such a beautiful morality would give relief to everyone. Adnan Oktar: “That is unbelievable. How could something like this be acceptable? How could you let that veteran pay for that? You are taking away that man’s foot for your own safety. That man gave his foot for God. You walk about freely, you run all over the streets, but that man cannot run anywhere, he simply sits at home. And above all this you are asking for that person’s money. That is a very shameful act. Changes should be made in these laws. Let us write a letter to both our Prime Minister and our President, Mr. Erdoğan, requesting the necessary regulations to be made immediately. Why do they make us experience this pain? And on top of that the Bank sends him to the court; that is unbelievable. This bank has a thousand and one different incomes. They should have said; “it would be a shame and a sin if we take money from this person.” They should have solved the issue silently. Why do they go and badger that person? Furthermore giving him such a prosthetic leg free of charge is not a favor; it actually is an obligation. Your leg is still there but he lost his. He made such a sacrifice. You are obliged to provide that to him. That is not a favor. That person is not in a position to be thankful to you for doing this. Actually you should be the one to thank him for accepting your help. To top it all, you are obliged to look after such a person. ]]>http://secretbeyondmatter.com/en/Mr-Adnan-Oktars-Daily-Remarks/193226/“our-state-should-establish-ahttp://secretbeyondmatter.com/en/Mr-Adnan-Oktars-Daily-Remarks/193226/“our-state-should-establish-aMon, 03 Nov 2014 03:46:44 +0200Mr. Adnan Oktar: "A 60 kilometer "no-fly" zone should be established on the Syrian border"
"The Republic of Turkey opened its borders and accepted about 45,000 Syrian refugees fleeing from Syria because of ISIS attacks in one night. According to some reports this number has reached 60,000." ADNAN OKTAR: "Masha'Allah. May God increase their numbers. God sends them along with their blessings, insha'Allah. But the region is in need of a design, this is not the way. They should give those lands a form, a design. I have been saying this from the very beginning. I told them that they needed to establish a secure zone there. There is no need to behave in such a polite, such a kind manner [towards Syria]. The Syrian border should be crossed, sparing about 50 or 60 kilometer land and that piece of land should be declared a secure-zone. They should announce that land as a "no-fly" zone as well. That is what should be done. There is nothing complicated about this. This doesn't mean beseiging Syrian lands. We will simply be establishing a secure zone, that is all. Even if Syria says, "I will not let you establish a secure zone, my friend," the UN should ignore this objection and establish this secure zone anyway. Such an objection would not be acceptable. We need to draw a line here. You will say, "This is a no-fly zone." I have been saying this from the beginning. If you say, "There will be no flights in between this latitude and that longitude and you are not allowed to fly over this zone," they would not fly over there. You will say, "Military forces are not allowed either," and you will circumvent those lands with barbed wires and temporarily give it a status of a foreign land. And that is it. You will then settle those innocent wronged people in those lands. And supply them with tents and what ever is need in those lands. It is as easy as that." "The US seems to be open to Turkey's offer to establish a 30 km secure zone." “In the first year of the incidents in Syria you've said that this turmoil would last very long. You said that it would not come to an end in a few months like they assumed. It really happened exactly as you said it would. Back then they could not foresee that it will last this long." Yesterday, with the Hashtags #TürkmenlereZulümDursun #StopViolenceToTurkmens he started on Twitter, Mr. Adnan Oktar drew attention to the attacks carried out by the armed forces of the Iraq- Damascus Islamic State organization against Turkmen living in the Çobanbey region of Aleppo. Turkmen have been in a struggle against the Al-Assad regime along with the Free Syrian Army for the last two and a half years. In this struggle they gave hand in hand with the Syrian people, Turkmen gave 28,000 martyrs. However, over the last few days Turkmen have been left alone facing the Iraq- Damascus Islamic State group. Today, 214 Turkmen villages near the Turkish border are under attack from this group because of the lack of means the Turkmen are suffering from. Yesterday, Çobanbey town was besieged by the Iraq- Damascus Islamic State. Seven Turkmen villages have been evacuated. Çobanbey is located just across from Kilis and is about one and a half kilometers from the Turkish border. The residents of Çobanbey are fleeing towards the Turkish border which is the only way out for them. The Turkmen women are being killed by snipers and the Syrian Turkmen families who are subjected to the attacks of the Iraq- Damascus Islamic State say that the life in their country is getting even worse each day. In order to attract attention to this horror that Turkmen living in the region are suffering through and to stop this persecution, Mr. Adnan Oktar made a call to the whole world. Mr. Adnan Oktar's call has been supported by thousands of people over social media and the hashtags #TürkmenlereZulümDursun #StopViolenceToTurkmens have taken their places in the trending topics lists of Twitter, both in Turkey and worldwide. "Yesterday, the armed forces of the Iraq- Damascus Islamic State organization - which is affiliated to Al-Qaida and which is supported by Al-Assad - have besieged the Çobanbey district of Aleppo, in which Turkmen reside, with a troop of two hundred vehicles and attacked Turkmen with mortars. Mr. Destici, the President of Great Unity Party, reminded that more than thirty thousand Turkmen, Arab and Turkish brothers and sisters are residing in this region and said; "If necessary, Turkey should even consider carrying out a limited intervention in order to prevent the possible massacre that might take place tonight." He also said; "Unless this siege is lifted today or somehow broken, if thirty thousand of our brothers and sisters are subject to being massacred on our border, no one can ever be able to carry their blood on their heads." ADNAN OKTAR: "Let us start a hashtag on Twitter about our brothers and sisters being persecuted there. Let us say #TürkmenlereZulümDursun (#StopViolenceToTurkmens). I mean if there is an attack aiming specifically at our Turkmen brothers and sisters -and it appears to be that way- let us say #TürkmenlereZulümDursun. Let us say it in English as well; #StopViolenceToTurkmens. ]]>http://secretbeyondmatter.com/en/Mr-Adnan-Oktars-Daily-Remarks/179969/mr-adnan-oktar-“stop-violencehttp://secretbeyondmatter.com/en/Mr-Adnan-Oktars-Daily-Remarks/179969/mr-adnan-oktar-“stop-violenceFri, 31 Jan 2014 01:17:40 +0200“Let us announce the persecution going on in Myanmar to the whole world." Mr. Adnan Oktar once again lent an ear to the voices of activists who keep making calls for help in the face of the most recent attacks against the people of Rohingya in Myanmar. Thousands of Tweets have been sent for three days with various hashtags Mr. Oktar started on Twitter in English and in Turkish. These Tweets with the hashtags #ArakandaSaldırılaraSon and #StopAttacksInRohingya #MyanmardaVahşetDursun #EndViolenceInMyanmar and #ArakanıKurtaralım #SaveRohingya are calling for all authorities, aid organizations and peace activists in our country and abroad to take immediate action and these Tweets had a broad impact in the media. The hashtags became the Number One trending topic both in Turkey and worldwide in a very short period of time. Many activists setting out to make the voice of people of Rohingya heard wrote scores of Tweets expressing their thanks for this sensitive attitude adopted under the leadership of Mr. Adnan Oktar. They have also stated that Turkey is a great source of hope for the salvation of the people of Myanmar. "The list of names of the people who have been martyred, lost and attacked during the most recent incidents in Myanmar has been announced. In that list, there is a 103 year old woman, some people aged 60-70 and 10 year old children. 30 women and young girls, six young men, and five children have been killed. Furthermore, 200 women and girls, 120 young men and 65 children have been lost. This is a very detailed list of names. The names of those people, their family names, and the names of their fathers have all been given." "Yesterday, you started a hashtag on Twitter related to the difficult situation our brothers and sisters in Myanmar are in. Many activists who take an interest in the events going on there sent messages saying, "While the whole world is going about their own business, while no one takes an interest in what is going on there because they are all consumed with their own interests, our brothers and sisters in Turkey have displayed a beautiful example of humanity for the Rohingya people. May God protect Turkey." ADNAN OKTAR: "Masha 'Allah. Alhamdulillah. Of course, this is our responsibility. We would have done much more if we have had the means but the things that could be done are very limited; we are not able to step out of those limits. But of course attracting the world's interest on this topic has an impact. Creating political pressure has an impact. We are thus using the most influential, most reasonable means. Concentrating on the most logical, wisest and shortest methods that would yield sharpest results is important." Our Muslim brothers and sisters should continue to warn the world constantly about the persecution going on in Myanmar. There is a serious massacre of Muslims all around the world and that is very widespread and gets worse day by day. Muslims should love one another and should protect and watch over each other. The Hashtags #ArakanıKurtaralım #SaveRohingya on Twitter became the Number One topic in the Trend Topic lists in Turkey and worldwide. The hashtags #ArakanıKurtaralım #SaveRohingya became the Number One topic both in Turkey and in the world; that is very nice. By that, we've attracted the attention of the whole world to this matter. Especially its becoming a Number One topic in the world lists is very important; it is impossible to say "I haven't heard about it, I didn't see it" from now on. They should all hear about this persecution so that the relevant authorities can take the necessary precautions. It is also the Number One trending topic in Turkey; that is also very nice. Our dear ones in Myanmar, the Rohingya people are sad, they are being hurt. All Muslims are suffering and there is not much that we can do. We can only attract the attention of the world to this issue by making such hashtags and by making them known and used by a lot of people. 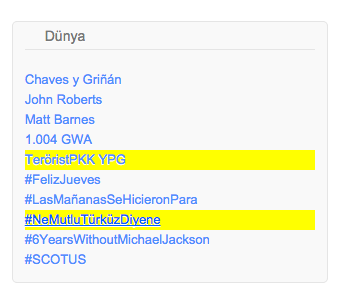 But praise be to God, these hashtags become the Number One trending topic both in the world and in Turkey. Of course, God is the One Who makes us instrumental in that. Alhamdulillah. "Our kind request to the UN and to Mr. Ban Ki Moon is to take the necessary steps to have this matter investigated by an international commission"
]]>http://secretbeyondmatter.com/en/Mr-Adnan-Oktars-Daily-Remarks/179332/“let-us-announce-the-persecutionhttp://secretbeyondmatter.com/en/Mr-Adnan-Oktars-Daily-Remarks/179332/“let-us-announce-the-persecutionTue, 21 Jan 2014 16:19:58 +0200Adnan Oktar:"Let Us Convey Urgent Aid to Yarmouk"
Mr. Adnan Oktar started the hash tags #YermükeAcilYardım #UrgentAidToYarmouk yesterday on Twitter to draw attention to the painful events taking place in Yarmouk which is a camp city a few kilometers away from Damascus, the capital of Syria. In the shelters in the Yarmouk Refugee Camp which was established as a regional Palestinian refugee center for those who took refuge in 1956-1957 following the Arab-Israeli war, about 200,000 Palestinians were residing prior to the civil war in Syria. Because of the conflicts during the civil war, Yarmouk was almost completely abandoned. In December 2012, 160,000 people left the region. Only about 18,000 refugees who have no means or places to go remained in the camp. During the last six months Yarmouk was under a very tight blockade. The Independent daily reported that the people in the region, which is controlled by the Syrian army and which does not let any aid pass by due to security measures, live on animal food, salty water and leaves. According to this report, women of Yarmouk Camp who go out to collect herbs to feed their children are being shot by snipers. 50 people have starved to death in this camp until now. Many people who try to eat herbs, cats and dogs have been poisoned. Aid trucks and health teams cannot enter Yarmouk in which about 15 to 20 people starve to death every week, because of attacks and safety worries. Mr. Adnan Oktar made a call to the whole world to take action by attracting attention to this humanitarian drama going on in Yarmouk and to transport urgent aid to Yarmouk. The hash tags #YermükeAcilYardım and #UrgentAidToYarmouk became the first trending topic on Twitter for both Turkey and the World. “Yesterday, you've started hash tags [on Twitter] #YermükeAcilYardım and #UrgentAidToYarmouk to transport aid to Yarmouk, and in a very short time both of these hash tags became number one trending topics both in the world and in Turkey. Right after this call, Sibel Eraslan made a call for helping Yarmouk in her article published today in the Star Daily. Again after this hashtag, Yeni Safak Daily also prepared a detailed report about Yarmouk and made a call for helping them. Time Turk news site reported about the impact of this hashtag started on social media and called everyone to help people in Yarmouk. ADNAN OKTAR: "Our hashtag became the number one trending topic, didn't it? Masha'Allah. Urgent Aid to Yarmouk. That is because our brothers and sisters are collecting herbs to boil and feed their children. How long could that go on? Think about it. There is gruesome violence and on the other hand, there are some scholars who keep saying, "There is nothing wrong! Nothing is going on in the world, everything in the world is rosy!" Look and see where these people are living, and where their world is. And there are people who follow those scholars, who rely on their words. Those women there are boiling herbs they collect and feed their children with that and these scholars here are saying "Nothing is wrong." There is a bloodbath in Syria, children are starving to death, and they [the Syrian government] are burning and destroying them with barrel bombs. And these people here keep saying, "There is nothing wrong!" There is a bloodbath in Iraq, Afghanistan is being razed to the ground, and we cannot even begin to imagine the state of the Muslims living in Far East. We cannot even begin to think about the Muslims in East Turkestan. Our brothers and sisters who want to help Yarmouk should again act with IHH, in my opinion. That is because IHH is a brave and strong organization. They succeed in doing what they set out to do and convey aid to their destination somehow. Look, for instance well done to MIT [the Turkish Intelligence Agency], may God be pleased with them; they've been piled into a truck and are trying to reach there. Well done to my dear ones: They are trying to enter the region with those trucks and that is a very dangerous thing to do. Who knows what troublesome regions they are passing through, who knows which dangerous districts they are passing through. Of course they might see people from Al-Qaida on their way and they pass by saying "As-Salamun Alaykom". Maybe they see some Shia militants and simply say "As-salamun Alaykom" as they pass by them. What else can they do? Are they to get in an armed conflict when they see them? Of course they have to get along with them all. They simply say, "Let us pass by; we are trying to convey humanitarian aid to the region." Adnan Oktar: “If Muslims do not approach to the Islamic Union, if they do not accept unity, they will martyr Muslims like this one by one, may God forbid. They have done this before his execution, is that so? May God forbid, that is the signature of their cruelty, their remorselessness and it is their signature of their hatred towards Muslims. He might have been an ignorant person, he might have lacked knowledge, but nevertheless he is still a Muslim. However his being martyred with such inconceivable cruelty should not make those responsible happy. Because of these ordeals and the pain he suffered, he has been granted the rank of martyrdom and his rank will thus be elevated. However the status of those who martyred him will be even deepened in hell. They will suffer for all eternity in the Ghayi valley of hell. While he will be living an endless life of pleasure in Heaven, they will suffer in the Ghayi valley of hell for all eternity. They didn’t think of that pain they will be facing. Actually while he was martyred, he didn’t even feel the pain of it, he only passed by with a transient ordeal. That blessed person has most probably invoked the Name of God and then Almighty God has taken him to the Heaven, to the post of martyrdom. Now we will altogether see the situation of those people who martyred him will be in the Hereafter. We will see what will become of them. And insha’Allah, we will see that persecuted, martyred brother of ours’ post in the Heaven. God tells us to “Make peace between Muslims.” That is the command of God. It is religiously unlawful for Muslims to be at odds with each other. “And obey God and His Messenger.” That means obey the Qur’an. Surat Al-Anfal,Verse 1. Surat Al-Anfal, Verse 46; God says; “Obey God and His Messenger and do not quarrel among yourselves.” That means it is unlawful to quarrel among ourselves. Quarreling is unlawful just like eating pork meat, it is unlawful just like drinking wine or like gambling. Furthermore, there is also tumult here; tumult is worse than slaughter says Almighty God. Not only quarreling, but dissension and tumult is also taking place. Tumult is worse that slaughter. For that reason no one should incite this tumult. No one should write articles that instigate further tumult. May God forbid, that would be very, very wrong. “Obey God and His Messenger and do not quarrel among yourselves lest you lose heart and your momentum disappear. And be steadfast. God is with the steadfast.” What does losing heart mean? Your connections would be severed, you would lose heart, you would be devastated and crushed, says God. You will lose your power; you would have nothing to do. You would lose your power of resistance. You would lose your power to improve, you would lose your health and welfare, you would lose heart, says God. You would lose all your material and spiritual power. You would be paralyzed, says God. “And be steadfast,” says God. Alright, there might be something going on, that is right, but you need to be steadfast and it needs to be calmed down. None of our brothers or sisters should ever write anything unfavorable, for the love of God. They should avoid writing anything that would cause tension and incite tumult. “God is with the steadfast.” Look, if you are steadfast everything will calm down and made right, says God. For that reason there is no need to instigate the tumult that is going on. The command of God is explicit. What does “...tumult is worse than slaughter” mean? It is like you’re killing a person. That means provoking tumult is like killing a person. For that reason, for the love of God, they should write calming articles, there is no need for writing things that would cause further tension and that would instigate tumult. In Surah Al-Imran, Verse 103, Almighty God says, I seek refuge with God from the satan, “Hold fast to the rope of God all together.” Hold fast to the Qur’an altogether. What does “hold fast” mean? It means uncompromisingly abide by the Qur’an. “And do not separate.” Act in unity, do not separate. “Remember God´s blessing to you…” Look at the beautiful blessings that we are living in. “... when you were enemies and He joined your hearts together so that you became brothers by His blessing.” We’ve been saved from the gangs, from the tumult, right? We’ve been saved from those who are bullying our people; we’ve been saved from unsolved murders. What is the sense in rocking Turkey like this? What is the sense in dragging Turkey into this fire? Look; everything is in such a mess and some of them are still stirring up dissension. There is major tumult going on, why do you not calm it down? No one, I kindly repeat my request, no one should ever write anything unfavorable and inciting. Be a soother [of tensions]. The law is working in Turkey. The court made those arrests; if they ascertain any crime, they will give the necessary punishment or else those arrested would be acquitted. The law is working in Turkey. They haven’t let them out, they court has arrested them and they say that they will put them on trial, that is okay. What will they say if they are acquitted? If they are guilty, let them serve their time but there are many people committing illegal acts. There are millions of guilty people all around the world; it is not something just newly discovered only in Turkey. We need to use a calming, soothing language. While everything is going on very nicely and smoothly, instigating this tumult is not acceptable. “Tumult is worse than slaughter”: This is a verse of the Qur’an. It is religiously unlawful for Muslims to have a falling out with each other and putting forth an effort to unite Muslim is a religious obligation. Adnan Oktar: “One might be guilty, I can understand that, but even then there is no need to execute that person. We do not say that he should not be given a life imprisonment. He might be guilty, but why is there the need to execute him? There is no need for such violence. He has already been given life imprisonment before. When he filed an objection about the verdict saying, “I have done nothing to deserve a life imprisonment,” they said, “Well then let us execute you!” First of all, this alone, is a grave ignominy. In such legal objections, a heavier sentence cannot be given during the appeal and this is how it is all around the world. I mean this is the law throughout the whole world. They have done such a grave ignominy. For instance, if the man is given five years imprisonment, when he appeals this decision you cannot give him ten years imprisonment, you can only approve that five years imprisonment during the appellate review. This is the case all around the world. And these people went on and executed the man. You are hanging the man while he is expecting his acquittal. You have already given the man a life sentence, so put that into effect, put that man in jail. Why is there the need to execute him? “The celebrations held after the execution are deep indicators of grave depravation; how can one celebrate an assassination? They would all be counted as assassins. See how people are trained to demand hanging, chopping people up, to demand blood. Actually let alone killing a person, just seeing one being killed is a horrible experience, even hearing about it is horrible. See how quietly they have executed that person. No one knows what has happened? What kind of a defense was made, what was he accused of? No one really knows. And some journalists believed in what they have heard. They keep saying, “He did this, he did that.” A person should be ashamed of saying something like that. Alright, the Pakistani army might have done these things; the Pakistani army is completely another issue. Well my brother, if you are strong enough, go do all those you’ve done to the Pakistani army. They are all very afraid of Pakistan, right? All those allegations are about the Pakistani army, yet they have found three tofive poor men and they are taking all their revenge on them that is a grave immorality. The witness is controversial; she says one thing now, another later. How can a person be executed based on a statement of a single witness? That is something never been seen anywhere before. An approach that invites such an immorality is not acceptable. One should strictly avoid that. One should strictly avoid writing articles that lack necessary facts. Using turns of phrases that applaud this persecution is not acceptable; that is because those who have carried out this execution should be ashamed of themselves. Or else they can repeat this immorality. I mean if they are encouraged, they would continue with such acts and they are doing so. There are other Muslims waiting for their turn, they will be executed as well. It should be openly seen that everyone condemns this execution. Writing articles in a supportive fashion or in a mediocre fashion would not comply with good conscience. It would be cruelty. They are executing a Muslim, an inoffensive person. God says if a Muslim is persecuted anywhere in the world, if a Muslim is being oppressed, if his rights are seized, Muslims of the whole world should unite and save him from that persecution. That is a verse of the Qur’an. That is the command of God and even if that person is not a Muslim, but an irreligious person, we would not want him executed. I mean that person might as well be a non-Muslim. Why would I want him executed? Even if he is a Christian or a Jew, I would simply not let him be executed. “Without the system of the Mahdi, without feeling that fervor inside regarding the descent of Jesus Messiah, the great majority of Muslims are left scourged. They have become loveless and merciless. This is how a majority of them are; they do not pity those who are persecuted. Some people demotivate the masses by saying, “There is no Islamic Unity,” “We are against Turkish-Islamic Union,” “ Mahdi will not come, Jesus Messiah will not come,” day and night. And after that an egoistical, selfish understanding of Islam prevails in the world. These people would then be after becoming rich. Some are interested in becoming a merchant, some are after another personal gain. That happens because they have emptied the souls of Muslims. The system of the dajjal has taken the souls of a majority of Muslims. There are only a few Muslims standing afoot. Almost 99 % of them are ruined by the system of the Dajjal. That is why Muslims have no power to resist any longer. Had they resisted, the others wouldn’t have dared to take such a step, they wouldn’t even dare to breathe. “This capital punishment given in Bangladesh is in conflict with the law all around the world, it is in conflict with European law as well. This is also in conflict with the current law in Turkey. Actually capital punishment should be revoked completely throughout the world. For instance, they have capital punishment in China and I am against that as well. They are executing our Turkish brothers and sisters in China and I stood against that as well. Well my brother, one might have committed a fellony, one might have killed someone, may God forbid. But why are you executing him? God says; “Make allowances for people, command what is right, and turn away from the ignorant.” Alright, there is retaliation in the Qur’an when a person is killed but even for that, God says; “If you forgive, it is better for you.” If God says something is “better,” of course we cannot select anything “less better.” So one should forgive. Then he can serve whatever punishment he is given in the prison.